Marvin Gaye, The O’Jays, Curtis Mayfield, and the Concert Film That Disappeared: 1973’s Soulful “Save The Children.” – LILY & GENEROSO 4EVER! Released in 1973, the same year as “Wattstax,” the film that documented the 1972 star-studded Los Angeles concert that was held to commemorate the Watts riots, “Save the Children,” also documented a 1972 concert. The goal of this concert and subsequent film was to raise funds via the Black Exposition conducted by Operation PUSH (People United to Save Humanity) in Chicago’s Amphitheater. Organized by Reverend Jesse Jackson, the proceeds were to help the growth of African-American owned businesses. 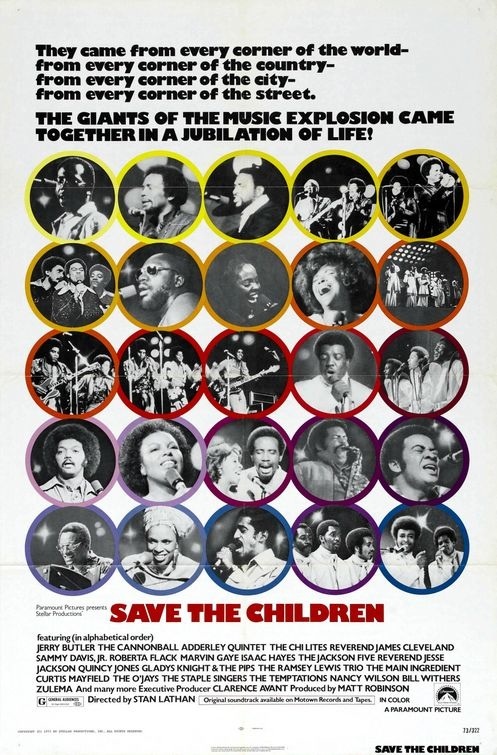 Similar to “Wattstax,” the collection of talent on “Save The Children” was staggering, but unlike Wattstax, the doc featured more artists from Motown than the Stax Label: Marvin Gaye, The Jackson Five, The Temptations, Gladys Knight and the Pips, as well non-Motown artists like The O’Jays, The Main Ingredient, and Chicago’s own, Curtis Mayfield. Directing the film would be Stan Lathan, who had gotten his start as an original director of the PBS children’s show “Sesame Street,” which I personally found very interesting as director Mel Stuart, prior to making “Wattstax,” had directed the children’s film, “Willy Wonka and The Chocolate Factory.” Now that’s a departure! The very well orchestrated camera direction by Lathan pays off here, as some of the performances are so intimately filmed, even for a large room, that they leap off the screen. As I write this, I am thinking specifically about Marvin Gaye’s performance, which was filmed during the socially-conscious height of his career. Marvin had released his masterwork, “What’s Going On,” a year earlier and delivered a heartfelt rendition of two of the songs from that record. Armed with superstar Motown bassist, James Jamerson in the background, Marvin sings the title track and “What’s Happening Brother,” in a way that will defy your ability to keep it together. One of the stranger musical moments of the documentary comes from Sammy Davis, Jr., who had been a financial supporter of PUSH and lifelong Democrat. He had drawn fire from the African American community during that time due to his political affiliation with Richard Nixon and his subsequent USO tour of South Vietnam, so when Sammy took the stage he immediately confronted the audience on his political standing and gets pushed back by a cascade of boos. Visibly shaken by this, Sammy defiantly and passionately sings “I Gotta Be Me,” which wins back some of the audience and then leaves with his fist in the air. I greatly admire Lathan’s decision to leave this awkward scene in the final cut, as it says more about the political climate in Chicago at that time than any other moment in the film. In fact, it is the lack of audience connection where I feel that “Save The Children” differentiates itself dramatically from “Wattstax.” We get a decent sense of the goals of PUSH and of the event itself, but the community’s opinion that was sought out in “Wattstax,” seems oddly missing from this documentary. Instead, we get a lot of rhetoric from celebrity speakers and a large assortment of graphic footage of not only American urban misery, but also the war in Vietnam, which all gets thrown in haphazardly and makes the overall message a bit blurred and thus the overall impact of the documentary is probably less than hoped for by Lathan. Despite the uneven message, you do get a grasp of the massive commitment by PUSH to make a positive change in Chicago and you also are privileged to see and hear a once in a lifetime collection of performances that are unmatched for that era. As for PUSH: after sixteen years of assisting African-American growth in business, that organization ended in 1987 after being mired in years of debt. Sadly, the film did not do well theatrically in 1973 and there has never been an official release, DVD or VHS, of this documentary due to the multitude of copyright issues that usually stem from whenever there is an assortment of artists from different labels. A few libraries have copies and many of the individual performances are available online. Just a heads up to you guys – it looks like it’s finally making it to DVD! Thanks very much Raymond. That is super news! I’ve been looking for this film/movie for years and have only come across 1 or 2 reliable sources since the late 80’s. Due to rights, in particular…..music publishing rights, this movie will probably never be released. I emailed the link above called ‘shopcegtv’ . I asked specifically about the quality of their Save The Children dvd and they answered only with how to order their dvd. I replied their reply, to me…back to them and indicated I wanted a clear answer, but the 2nd time, they didn’t respond at all. I decided forget them and didn’t order. I hate sellers that won’t answer questions or won’t answer honestly. In more ways than one there are poor copies floating around the world and I’ve spoken to some of the ‘victims’. My best copy came from ioffer.com and I was satisfied .